One of the many fundamentally British activities that has stood the test of time is the art of tea-drinking. So it comes as something of a terror in the heart that British people are drinking less tea in recent years. 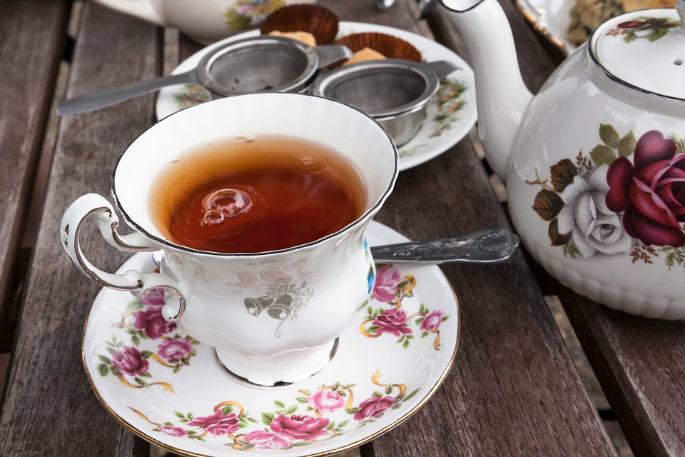 More accurately, Brits are drinking less traditional tea. But the market still seems to be going strong, with the value of tea going up 0.6%. Discover the tea-drinker type that suits you! Both National Tea Day and the birthday of Queen Elizabeth II land on 21st April. So, now’s a great time to ask yourself: what type of tea-drinker are you? After all, you’ll certainly want to have a cup of tea on this very British day. To find out what type of tea drinker you are, we’re turning to hard numbers. According to the Modern Tea Trends 2019 study, 50 per cent of tea brands identified the 24–35 year old group as their biggest growing demographic. Perhaps because of this, the view of tea has changed. It’s no longer a milky, warm beverage that sits on a table while people discuss problems, though it is still the go-to makeshift remedy for everything from a bad day at work to a broken leg for some. Now, tea has a swathe of health benefits to its name. It’s more than a murky brown leaf-water, it’s a bright and colourful variety of health and wellness beverages. 80 per cent of brands are watching the wellness trend as a key asset for tea. National Tea Day has, therefore, created two categories of tea-drinkers. Ready for a quick quiz to find out which type you are? Is it more important to you for your tea to be comforting or healthy? If a good strong brew can’t fix it, it’s probably not worth fixing. A good tea should give me energy, pep, and cleanse my inner being. Creamy or milky. Best described as a ‘hug in a mug’. Whether it’s red, blue, green, or purple, it needs to be bright and beautiful. Sensual, or aromatic. The experience of my tea is not just in taste but in smell. It should pamper my nose as much as my tongue. Traditionalists are those who pick mainly option a as their answer. You care about your tea being a healing drink, but not necessarily in the sense of it carrying antioxidants or being hydrating. It’s just about comfort for you, a means to relax and calm down with a soothing cup of milky tea. Modernists are those who pick mainly option b as their answer. Times are changing, and so is your go-to tea. Your tea isn’t always designed to make you fall into a milk-and-sugar-wrapped blanket of cosy warmth. Sure, camomile tea will relax you when you need it, but you have tea for every occasion. For energy, for a cold, for digestion, for preserving health, for anxiety, you name it, you’ve got a type of tea to wind around all the senses and sort it right out. The beverage is almost secondary to the experience these days. This ties in with the rise of herbal teas over standard black leaf tea — herbal teas come in so many varieties, from all over the world, and often have intricate ceremonies or stories attached to them. These aspects are as much of the ‘sensual’ experience as the tea itself. Cafés and tea rooms have been using this to their benefit too, offering tea experiences for their customers, such as offering food created to complement the flavour of different herbal teas, or brewing the leaves in a beautiful antique silver teapot in order to achieve a higher brewing temperature than a normal teapot, and making use of silver’s neutrality protecting the pure taste of the tea. The whole experience is catered for the customer’s enjoyment. Tea can also be a very flexible option. It can be enjoyed at home with full control over your personal taste, or out enjoying an aforementioned experience and story. Not only is this tea a beautiful red shade, it’s also calorie and caffeine free. It has a sweet and tart taste and is popular in North Africa and Southeast Asia. Particularly in Africa, hibiscus tea is touted as having many benefits, including helping with a sore throat and high blood pressure. Indeed, one study has noted that hibiscus tea contributed to the reduction of the systolic blood pressure of its participants. Barely tea is hugely popular in Japan, China, and Korea. Served hot or cold depending on the season, this go-to Korean drink is made from whole grain roasted barley and has a mild nutty taste. Like hibiscus tea, it is caffeine-free. There are a lot of health claims tied to barley tea, but only few have been proven by scientific study. These range from claims to help with cold symptoms, aiding a sore stomach, clearing complexion, and even weight loss. But, if nothing else, it’s a great caffeine-free alternative to coffee and traditional tea! This next tea can work wonders if you’re suffering a cold. This golden-coloured tea has the main claim to fame for fighting cold symptoms, but it’s also been said to help with everything from weight loss to acne. With the vitamin C boost of lemon, and the cough-supressing nature of honey, this is a drink that does have some scientific backing in terms of helping with a cough and sniffles. But the claims of clearing acne and weight loss are unconfirmed by scientific study. Still, it is definitely one to reach for next time cold season comes around. Green tea is no stranger to having health benefits claimed under its name. You’d be forgiven for thinking green tea was brewed from the Fountain of Youth, for all the attention it has gained in the wellness industry. But are any of the stories true? Thankfully yes. Green tea is packed with antioxidants and catechins, the latter of which could slow down bacterial growth. The green brew has also been claimed to reduce the risk of cardiovascular disease and boost metabolic rate. This tea is one you’ll want to show off to your Instagram following. This blue brew changes colour depending on the pH level of ingredients added to it — for example, a little lemon will turn it purple! Butterfly pea flower tea sounds fancy, looks fancy, but does it bring anything fancy to the table of health benefits? This blue tea has been enjoyed in Asia for centuries. But it’s only started fluttering into the western world of tea in recent years. The tea, like green tea, carries a lot of antioxidants, and has been tied to claims of protecting the skin. There are studies that support butterfly pea flower tea’s ability to help reduce internal inflammation. A warming, purple-shaded drink that is a tad more fancy than Ribena. Herbal blackcurrant tea doesn’t always brew with a purple hue, strictly speaking. But the purple berries that make this tea bring some great potential benefits to your tea cup, such as a high vitamin C level, antibacterial properties, and reducing inflammation. Purple tea sounds quite mundane. But its alternative name, ‘ox-blood’, sounds much more ferocious. It is claimed that purple tea could compete with green tea for the crown of most purported health benefits, such as claims to help protect against cardiovascular diseases and there are even stories of it improving vision. Herbal teas tend to come with a fair number of health claims, though not all are proven. But if nothing else, tea does count towards your daily water needs, with the dehydrating claims of tea having been debunked. So, top up that tea cup — it’s trendy and healthy!